We ended on yer actual cliffhanger last week (thanks to Vyctoria Hart for so ably deputising) with the preternaturally able Childermass shot by the increasingly loopy Lady Pole. Last week was a bad one for servants all around, with Strange’s man Jeremy killed in the line of duty by a French cannonball. The reactions from the two magicians tells you all you need to know about the two men: Strange was cut up by his friend’s death, Mr Norrell chides Childermass for wasting away his days in bed (spoiler – he survived). Left alone to their own devices, it is conceivable that Strange and Norrell would continue to get on. Sure, there are huge differences in their temperaments, opinions and, latterly, experiences but since when do friends always think alike? Alas, the machinations of others (such as Lascelles, Drawlight and old Bony, back to wreak havoc on the continent) conspire to wrench this partnership in twain. Drawlight, for one has being bandying Strange’s name around, claiming that the young magician will perform magic, often black, for commission. This comes as news to Strange, with the added insult to injury that it interrupts his billiards game. To prove that he is indeed Jonathan Strange to the incredulous Nottinghamshire folk, he gives a demonstration of his magic, by promptly disappearing into a mirror. Through the looking glass, he finds a strange land populated by floating staircases, like something out of an Escher painting. Strange soon finds he can traverse London using this land, which he identifies as the King’s Road from Raven King legend, and uses his newfound skill to pay Drawlight a visit. There’s a wonderful moment of comic terror from Vincent Franklin as Drawlight as he sees Strange come towards him in the mirror, turns around and sees nothing , turns back and is set up by Strange. Confronted with his schemes, Drawlight goes to ground immediately, breaking cover only to seek help from Lascelles. Lascelles advises Drawlight to lie low, then rats him out almost before Drawlight is out of earshot. No honour among wankers. Strange isn’t content with falling out with just one of Mr Norrell’s flunkies though, oh no. He also falls foul of the odious Lascelles when he writes a savage review of his book (despite the fact that both he and Mr Norrell are the credited authors of the work). 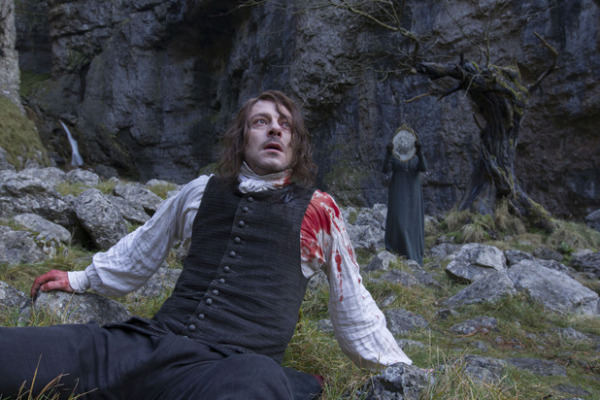 Lascelles is incandescent, Mr Norrell merely hurt. The culmination of all these frictions is that Strange believes he is best parted from his mentor. Mr Norrell’s reaction is really rather touching – he’s genuinely upset and very atypically offers Strange all manner of concessions, such as complete access to all his books, to try and get him to stay. It is scenes like this, coaxing the humanity out of dour souls like Mr Norrell, that really let Eddie Marsan shine as an actor. Strange even how time for a row with his wife, who wants him to promise never to go back to the King’s Road. Naturally, he refuses. Didn’t Arabella push him in to taking a profession? The best thing about this scene is the presence of Strange’s two Redcoat buddies, who stand ramrod straight and stare rigidly at the wall throughout. The Stranges patch things up, of course, but forces greater than they conspire to once again tear them apart. The first is Napoleon, back in power in Paris. Wellington needs his magician back on the continent to help out. The second, even more sinister power is The Gentleman who plans to steal Arabella away from Jonathan. He reveals part of his plan to Stephen Black when he has the Butler wrestle some moss oak from a bog. By using some of Arabella’s tears (from a purloined handkerchief), The Gentleman is able to have the oak take on the form of Strange’s good lady wife, albeit with terrifying reptile eyes. Perhaps the creepiest aspect of The Gentleman so far is his patronage of Stephen Black and in particular the way he draws Black in as co-conspirator. ‘Yes Stephen’s that a terrific idea!’ he’ll exclaim before laying out the next stage of his dastardly plot. Black has invariably said nothing. Meanwhile, Lady Pole’s plight has gone from bad to worse. After last week’s little incident, she’s been packed off to the North, put into an asylum of sorts, run by those fine chaps John Segundus and Mr Honeyfoot. As she herself notes, her days as well as her nights are now spent in captivity. She’s not left alone though, Childermass soon rides north, apparently looking for answers rather than vengeance (why was she surrounded by magic? What did Norrell do to her?). He’s stared down though by Segundus who shows really resolve and finally turned away from an excellent bluff by Honeyfoot (‘All I could find were walnuts!’). 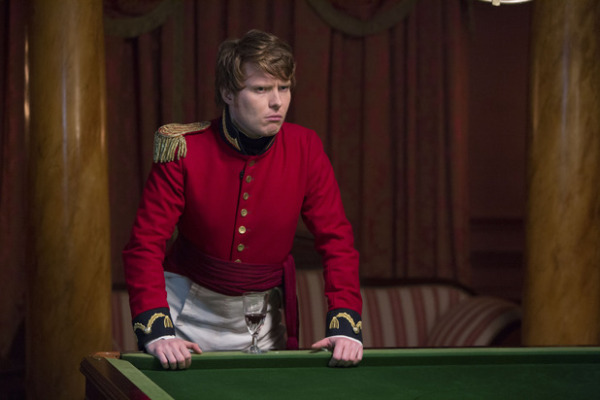 These two, Segundus (Edward Hogg) is particular, are really developing as characters and like Arabella last week are showing signs of stealing the show. 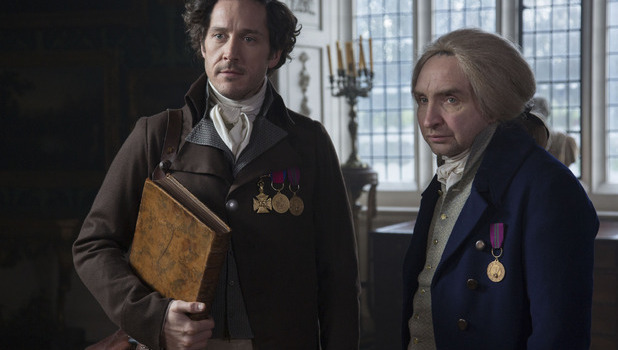 Jonathan Strange & Mr Norrell has really been excellent so far, showing real ambition and blending historical drama, fantasy and comedy seamlessly. It’s also been beautifully cast from the leads on down. Be thankful then that it is based on a single novel and isn’t up for a second – on Sunday night ‘All The Mirrors of The World’ got a pitiful 1.78M viewers. To be fair, it’s not typical BBC One fare (aside from its budget) being based on a 900 page fantasy novel. Still, it deserves better than that. Stay loyal and come back next week for episode five. Michael comes from the middle ground between light and shadow, between the pit of man's fears and the summit of his knowledge. He will write on comics, TV and film, plus anything else that might occur to him.